Is Casino.com Good or Not? We suggest to check these Casinos that are available in your country or visit this full list. There's no other site in gambling like Casino.com. After they ponied up $5.5 million to buy the Casino.com domain, the guys at Mansion Europe Holdings Ltd created a state-of-the-art Casino site where you find all the best games to play. 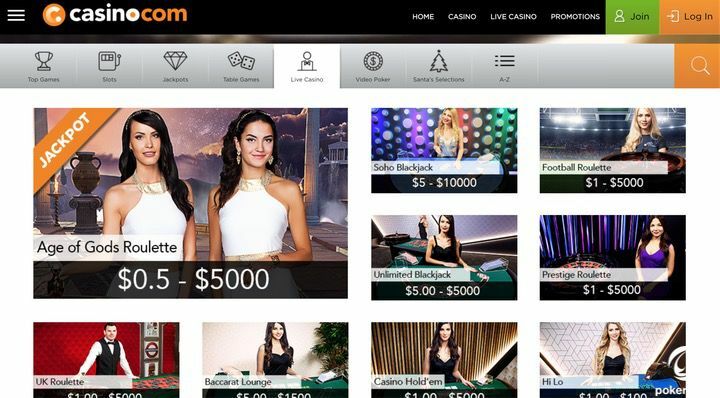 To understand if Casino.com is really the best online Casino site of 2019 we decided to put the platform to the test. We analyzed their bonus offer as well as all the games they feature and their deposit options. Also, we tested their mobile platform - because Casino.com claims to be a great mobile Casino site for iPhone, iPad, and Android players. If you want to know what we found out, read on this in-depth review of Casino.com and discover everything there is to know about one of the most celebrated Casino sites in the world. From e-wallet services like PayPal and Skrill to more traditional payment methods like Visa and MasterCard credit cards, you will find extremely easy to deposit to and withdraw from an account at Casino.com. For a complete overview of the payment methods, you can use to play real money games at Casino.com, have a look at the list below. I always wanted to know what it would be like to play at the 23rd most expensive domain in history. Purchased by Mansion Limited for $5.5 million, Casino.com is a site that was born to succeed. Because when you start with such an investment for the domain name alone, you can't afford not to be the best. 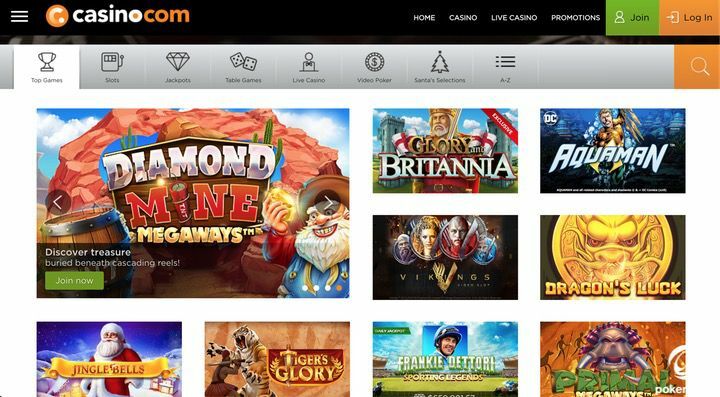 But - is Casino.com the best online Casino site in 2019? To understand if this is a state-of-the-art Casino site and to find the answer to questions about the legitimacy of the platform and the real effectiveness of their mobile Casino app, I opened an account, and I started to play. The three-step signup process is very quick. You only need to fill out the form with some basic personal information to receive an account. The account is completely free of charge. Don't forget you get 20 no deposit spins for Age of the Gods Slots. The free spins are yours on signup. Confirm your account, log in, and you are ready to go. That's where the magic begins. The supersized menu right at the centre of the screen is the only one you need. Use it to access all the games at Casino.com. 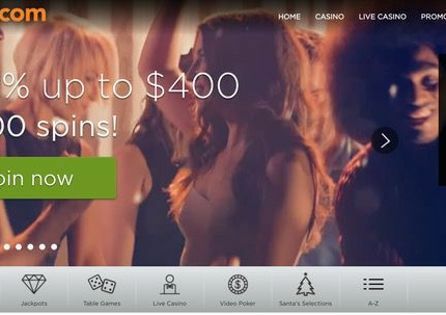 Known for their excellent Live Dealer games (more on this later), Casino.com is home also to a great selection of Slots, Table Games, and Video Poker. However, you might want to look elsewhere if you like to play Bingo (not an option) and Keno (there's only one game). But if you can survive these two small misses, the site has everything you need to gamble online. Literally. What Games Can You Play at Casino.com? Here's an overview of the Casino games on the site. Keep in mind they add new Slot machines all the time, so there might be even more games when you register. She main focus of the site is on Slots so, if you are an online Slots player, Casino.com is a safe choice for you. Here you can play Sames from top providers like Playtech (234 games), Netent (34 games), and Ash Gaming (21 games). Since Vikings-themed TV series got traction on Netflix, Viking Slots started to appear everywhere. Once on Casino.com, have a look at Call of the Valkyries by Playtech. This amazing 25-payline online Slot comes with a great soundtrack and stunning graphics. And yes, there are big prizes too. As I said earlier, Casino.com is known to offer some of the very best live dealer games in the industry. On the Live Dealer section, you find 23 live games with all the classics you expect - and some more. Besides some great games of Roulette, Blackjack, and Baccarat, you also find exciting niche ones like Hi-Lo and 3-Card Brag. Did you know Age of the Gods is now a game of Roulette too? With four progressive jackpots, an amazing setting, and bets starting at £1, this is one of the most exciting Roulette games at Casino.com. 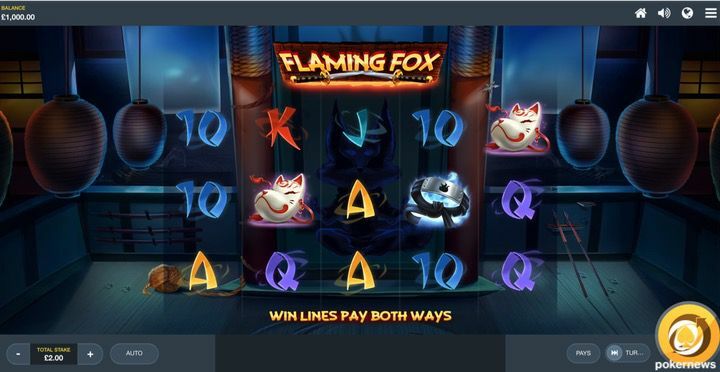 As a mobile Casino player, you have two ways to play at Casino.com: you can download the Casino.com app (iOS only) or you can visit their site and play from the browser. I prefer in-browser play as I have a rigorous policy on the apps I download to my iPhone and I have to say that Casino.com did a great job here. All the mobile Casino games available on the site are in both real money / free play mode, so you can have a lot of fun even if you don't want to gamble for cash. Casino.com is a great site - and I don't say this lightly. Their Casino site is amazing and their reputation is simply stellar. They are known to be some of the best guys you can find in gambling. You find great games, a software licensed by the United Kingdom Gambling Commission, and you know you are going to get paid when you win. Also, Casino.com is a PayPal Casino site - meaning deposits couldn't be any easier. All in all - yes: Casino.com is a safe and a smart choice if you are in the market for a great Casino site for real money Slots and Live Dealer games. Is there a Casino.com demo version of the games? Yes, most Casino games at Casino.com have a demo version you can play for free. What are the Loyalty Points for? You earn Loyalty Points every time you play real money games at Casino.com. You find all the details about the bets needed to earn Loyalty Points on the Casino.com website. Casino.com's Loyalty Scheme features five levels (Bronze, Silver, Gold, VIP, VIP Elite), each one of these giving you access to different exclusive bonuses. Where can I download the Casino.com mobile app? You can download the Casino.com mobile app for iOS on this page.